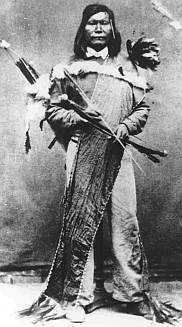 Numaga, high chief of the Paiute during the war. Accounts indicate that the volunteer militia of 105 were poorly armed, badly mounted, and almost completely unorganized. They met at Williams Station and finding no natives, they headed towards Pyramid Lake, a known settlement of the previously friendly Paiute Indians whose chief had recently died. Along the way they encountered a small party of Paiutes on a rocky hill. The whites attacked the Indians who fled after returning a few shots. The Indians continued firing sporadically as they fled into the ravine with the 105 militia pursing them. Once in the ravine 200 to 300 Paiute warriors appeared and began shooting. They closed off the route of escape and fired on the militia from all sides. The civilian militia headed for a patch of woods as their only escape and some of the survivors of the battle were pursued twenty miles. Up to 500 Paiutes are thought to have participated in the battle. The total of dead was seventy-six civilian militia members. It is unknown how many Paiutes were killed. ↑ Christopher Corbett, "Orphans Preferred: The Twisted Truth and Lasting Legend of the Pony Express", Broadway Books, New York, 2003, pp. 178-199.